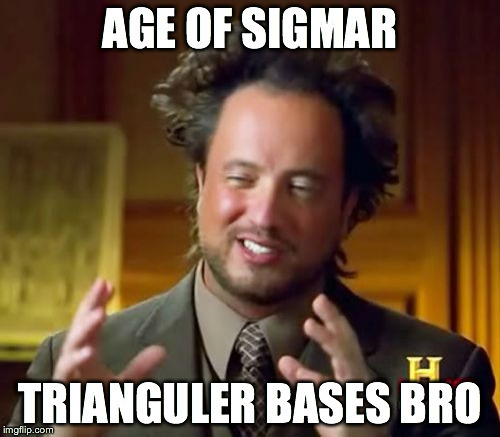 As my gaming group continues to play WFB and AoS, I thought I'd look into the differences between round and square bases... well... shape aside. I could ramble for minutes on how and why, but I think the pictures speak for themselves. I started off with the basic infantry bases, 20mm square vs 25mm round. The blue circles denote the range of the weapon, measured from the base (because models are a little hard to model on this). The 1" range just about scrapes by the size of a base, but it's a vague measure at best. You'd have to "abstract" the idea that if a model is in base to base contact with an enemy base, then the 1" range will make all models behind it in contact. Personally I find that a little iffy, so I'd recommend the second formation for round bases instead which make it a little easier to be in range. Likely as not, during pile-in such an optimization can be done on the spot. When we compare that to a similar formation on square bases, we note the difference is small. I'm not saying there's no difference, simply that it's rather small. It shouldn't have a big impact on the game. We can fight with an extra rank. Again, the orderly ranks with round bases make it a very narrow fit but the second formation for round bases makes it a lot clearer that the third rank should be able to add their attacks. I coloured the circles in the middle to show their effectiveness in protecting the flank. To the left, the lightly coloured bases have effect. To the right, only the center one has an effective range. When comparing this to square bases, we see a small difference. The front attacks are more or less the same, but to the flanks the square bases are better defended. The difference is small, however, and likely to be lost once you break formation for pile-in. I had been wondering for some time and suspected that squares would be denser, therefore more effective in concentrating power. You show that it is actually the case, but staggered formation is extremely close to squares. It could be worth to investigate, in case of two units of similar, medium size (15 vs 15), the merits of striking last, with a starting position in the flank. Minimizing the opponent's number of hits could well compensate the early loss of a few models. If that proves right, then the common sense perception that you want an odd number of charges might be contested. If you charge a small unit with a large one, you wish to have the line of contact as large as possible so as to maximize your number of attacks. You also want to strike first and make casualties in order to minimize return hits. Now, if you charge a large, compact unit such as those you show, with a small unit, either a 5 men elite, or a single model monster/chariot, could you highlight the best place to do so? Obviously that is the flank, but could you quantify the difference that it makes with the pile-in? Final note on those formation, what would be the best formation if you prepare yourself to receive a charge (for example for a unit of darkshard who don't wish to be charged but can't help it)? Does it make a difference if you expect a charge by a large unit or by a single model? Of course, the real solution in AoS is to get big metal sheets and just put magnets on the feet of all your models. That way you can get maximum densities pretty easily. From what tournament rules I've seen "measure from the base" seems to be a common comp and others prohibit base stacking, I think. Anyhow. I don't have a straight answer ready for what is an optimal defensive formation, Calisson. Not yet anyway. Every time I think I found a defensive formation, I find an easy counter. I think the liberty from the charge move and the pile-in make it difficult to prevent an opponent from optimizing their attacks. The control you can have on your opponent, because of your formation, is limited compared to the liberty of movement that your opponent can enjoy. - By minimizing your footprint, you can reduce the number of models the opponent can bring into range. - A smaller footprint is easier to encircle, and easier to bring more models in combat with. The conflicting logics don't end there. A wider formation will ensure you are more difficult to encircle, and perhaps even make it easier for you to encircle an enemy. But it makes you more vulnerable on the flanks. A small note, I like the label "staggered formation". I was struggling to find a good name for it. The technical/mathematical term is hexagonal packing (of circles). If you look at the second last formation above, then one circle is coloured red/brown. He is surrounded by 6 circles of the same size (hence the name). It also shows the problem we face. If you push one model forward, you get 6 enemy models in base to base contact or 6 to 1. Assuming they fight in only 1 rank, that is. A unit of 2 models can be surrounded by 8 enemy models, or 4 to 1. On one hand that's more models from the enemy, but it gives better odds. As we continue to increase the size the odds improve but the enemy brings in even more attacks. Because "defending" is so difficult, I tried to look at a different kind of formations by setting different goals, namely reducing my own unit's weaknesses and creating local superiority. The first formation is given as a reference. It's small, and I think it's quite powerful. Make that 9 Black Guards and given a pile-in they'll all attack in any direction required. Below that, I slightly optimized it with the staggered lines. The brown model shows the range reaches all corners of the formation. As such, at most 1 model can't attack in which case you have superiority of numbers. I then tried to expand on that idea, first row, second picture. This is a repeat of the formation in a larger unit, or a cooperation of 3 small units in that formation. The topmost group is the one aimed at your enemy. The "gap" between the first 8 models and either of the rear groups are dead zones. Anything that goes there gets battered by two full groups. So it's not as attractive an option for the enemy to try to encircle the first group. In case the enemy tries to maintain an orderly line against the front group, then a regular pile-in will bring the rear groups in combat. The weakness of this formation is a delicate flank attack against the bottom, outer model of the rear group (say, left-most bottom model). There a pile-in may fail to bring in enough models. Mind that this is a delicate balance: if the opponent tried to encircle any of the rear groups, a pile-in will see most models brought in range. Still, if needed, you can contract the unit: first row, third formation. In this case, the weakness is largely dealt with. But it is a little less flexibly to the front. I tried a larger variation, which could be seen as a circle formation: second row, second formation. The red dots are enemy models. Now the trick here is that each side is fairly well covered. The enemy will have a challenge to avoid the full weight of the unit: in a frontal attack, the red dot is outmatched 6 to 1 (but obviously, there will be back up behind it). If he brings a model to his left and right, he makes it easy to pile in completely. If the opponent tries to encircle you (second red dot), then the unit gets to fight almost completely before even piling in. I tried to increase that to two such groups working together, second row, last formation. The funny thing here is the gap in front line. It will allow the opponent to bring in 1 more model at best, but you'll bring in 2-4 more models. This way you can put more attacks at the same front than you get with square bases. This assumes that the diameter of the base is as big as the square's side. Is that true? You seem to have skipped over the fact that distances are measured from models themselves, including any weapons. This means a formation of spears with strategically positioned weapons can have as much as an extra inch of reach in one direction. my friends DOW pikemen minis were scary when we used the standard rule of measure from the model. we had a good laugh but it was countered at the same time with a charging unit. the extra long spears gave me less ground to cover when charging. we figured that because it all cancelled out we could just try measuring from the centre of a model. kind of like the Centre of mass of a mini. and it worked fine. we also tried bases to base and it was fine too. it doesnt matter where you measure from as long as both players are measuring from the same spot it works out. Those Formations are really interesting and can give your opponent more of a mind game to play with. Except that what you do is you place blackguard with their halberds pointing straight up in the front (and I guess measure from their feet?) and then the ones with their halberds pointing forward at the back, this increases your attacks but your front rank is no nearer the opponent. The square bases are 20mm on the side. The round bases are 25mm diameter. This seems to be the smallest round base available, and it's quite a good match in size. What the round bases gain in width, they lose on the corners. I'm a bit puzzled by the layout you present. A shifted line of round bases is presented above. It's actually the same hexagonal packing (hexagonal since you can fit 6 circles around a central circle) as the one you present, except you turned yours by 90 degrees. While it narrows the frontage, it doesn't improve the range of the bases. The first formation is the one you're presenting. The second one is mine. In both formations, I coloured the central base in the back and its range in brown. Technically/theoretically speaking, the first formation still enables the back model to reach the "front line" if the enemy actually pushes a model in the gap. But we're taking an 0.8mm margin. That's a bit narrow to make a call on. The second formation will probably be less prone to discussion. Of course, after a pile-in, any difference could be removed. But for a pile-in, both defensively and offensively, I would prefer a wider formation over a more narrow one. I'd prefer the second formation for those reasons. Line of spears all showing their backs to the enemy (for longer charge distance) and in pile up, the all spin on the spot, turning spears forward. All the advantages with no disadvantages. When piling up, you may move up to 3". If you turn the models, this adds to the move. No part of the model may move further than the model’s Move charracteristic. So actually, not an advantage nor a disadvantage, unless you're a regiment of spears against a single model, then it allows you to concentrate more attacks (just like in RL). If you measure from the model, then pivoting costs movement. Besides, turning is less efficient than simply moving the model closer without rotation, unless you ran out of space to put your base down. This is why the measure from the model and "bases don't matter" is sometimes frowned upon. In theory, bases shouldn't be a limitation and stacking bases is legal if the models permit the space for it. Or removing the bases all together, as Rork said. Yes, but you're already lined up in a formation, you don't actually move the models anywhere, just spin them around as their 3" pile in. So that's just one variety of pile-in movement. I'm not saying rotation is bad, just less efficient. Let's say we have a 25 mm round base. And you make the spears stick out for about half an inch. In total, from the center of the base to the tip of the spear, we have 1". Turning a quarter costs you 1.6". If you were charged in the back, then turning around wouldn't work (well not fully). The distance gained, with respect to the center of the base, is 1". Of course, we could use a different point on the model as pivot point to reduce the cost of the turn but then the distance gained is reduced also. The more you tailor your model to have a large footprint, the more costly this becomes. By sticking out a full inch, good for a 1.5" radius from the center of the base, a quarter turn costs 2.4" for a 1.5" gain, almost your entire pile-in. For many models, it's half their movement. In fact, with 3" as rotation freedom, the max length from the pivoting point you can have is 1.9". Considering how much easier it is to flank someone, I'm not sure I'd want to tailor for the front. We need to free our selves from the square vs round debate and embrace the true base polygon! I should add, though, that once you've moved your distance to your target, that being able to rotate into range is always an option you wouldn't have if you don't have a piece of the model sticking out. It doesn't reduce your options, but increases them. The benefit just won't always apply. In fact, I don't expect it to make a tremendous difference unless you're playing units of 40-ish models. I'm not sure if I understand your explanation on the rotation but let me try an example in how I see it. Unit of spears facing away from the enemy with their spears sticking out 1" from the model get charged, enemy piles in and likely max two "ranks" get to fight due to 1" range weapons. Now spears get to pile in, they spin on the spot so the spear tip travels 2" total in a straight line through the model to the other side of it, and then the spears can still make another 1" step towards the enemy to close the gap. Now with spears having 2" range, each model has an effective range of 3" as measured from the base, allowing for 4 ranks of spears to fight back against the front rank of the enemy. 5 ranks if you squeeze them really tight together (after all bases don't matter, and our spears can be assembled rather "flat" with a spear sticking out forward). Spears sticking out 1" from a model which has a base as wide as, let's say, 1", if you spin the model, that's a rotation of 1.5" radius. If you rotate 1.5" radius around the center, the tip makes a total distance of pi x 1.5 = 4.71". What you propose is just illegal. Pivoting would have to be measured for the radius of the outmost point of the model, not just the difference in distance achieved. Hence it's less efficient. As I explained above, and in my thread on thoughts on AoS, the most "optimal" movement is sliding your model with no difference in orientation (if you measure model-to-model). It's only when you get stuck that pivoting could still make a difference. But even so, from the games I played thus far, it's rare for a pile-in move to fail to bring all models in range, unless it was a choice or the distance was over 5" before the pile-in. Neither case can be solved by modelling differently, or rotating for that matter. I know it sounds counter intuitive, even though it's logical. I'm not saying there's no situation where modelling the unit as you mentioned can achieve a beneficial situation, just that most of the time it won't matter or that the benefit is more situational than it may appear. I'll try to make a video about it tomorrow and some graphics to explain. Perhaps it will be more clear then. It's also a good argument, IMO, why it's simpler to measure from the base. It brings it all down to a simpler, more structured approach without any perceivable difference to the game except comfort of use. Where in the rulebook does it state that repositioning a model is done with respect to the axis perpendicular to the flat table surface? I don't see that anywhere. EDIT: Nor do I see anything about it needing to be a circular rotation either. Exactly, the only actual rule is that no point of a miniature can move more than its M value. I read that as a difference between starting and ending point, because everything else makes less sense. Or to be more cinematic. The spearman lifts his spear, spins on his heel and points it at the enemy. Where in the rulebook does it state that repositioning a model is done with respect to the axis perpendicular to the flat table surface? Interesting remarks. I like that abstraction of the spear being lifted and lowered again. It's quite thematic. I'm not sure I read the rules the same way, but I would have no objection to playing it that way. Just because this discussion has been continued for so long now, I'll add for the record that I have no big objections against the way you're presenting these rules and would play along if my opponent asked to play it that way. I don't think it will break the game or change it considerably. But I haven't been convinced yet and still see it differently. I'll try to put it in a vid later. Most of all, my conflict is that it's an abstraction you are making.. It is not what you are physically doing. If a model moves 3" forward and 3" sideways to dodge an object, are you counting this as 6" or the direct line between start and end, thus a little over 4"? The 6" distance seems logical to me. It is what you did. Doesn't the same logic apply when turning a model? You count the distance moved. If you measure only the difference in distance of the speartip before and after then you are abstracting that the physical model is transformed through a point of symmetry and your 180 degree turn is achieved that way. Again, I'd be ok with that on the table, but it's not what you're doing. What you're doing is rotating the model. In fact, if the model were to lift its spear, turn about and lower its spear again, then you get the same distance moved as rotating sideways. The tip of the spear still makes the same semi circle. This would also be true regardless of what axis you use, in any degree. Except it may get a little complicated if you don't stick to the plane offered by the base of the model. It would be legal to do so, but it may tilt your model which gets tricky to maintain. Again, I think this is much clearer with a vid and an actual model on the table. But I do like the arguments brought forth. I think they are creative and think out of the box. I wouldn't waste game-time over this, but I do like delving into this and see if we can find a way to get on the same side of this.